This board is a POB-PROTO lite. It doesn't have the power component to drive engine, so you can use the field to put your own components. 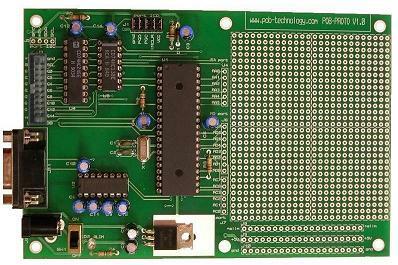 With this module, you can create an interface for the POB-Eye. It's send with a source code. If you want, POB-Technology provides the assembleur code of the communications functions and the schématic of the board. All these elements you will be sent by mail. o a support 40 pins to remove the Pic. o a connection dedicated to the programming via the ICD2 of Microchip. o The PORTA, PORTD and 6 stichs of the PORTS are available to the user.